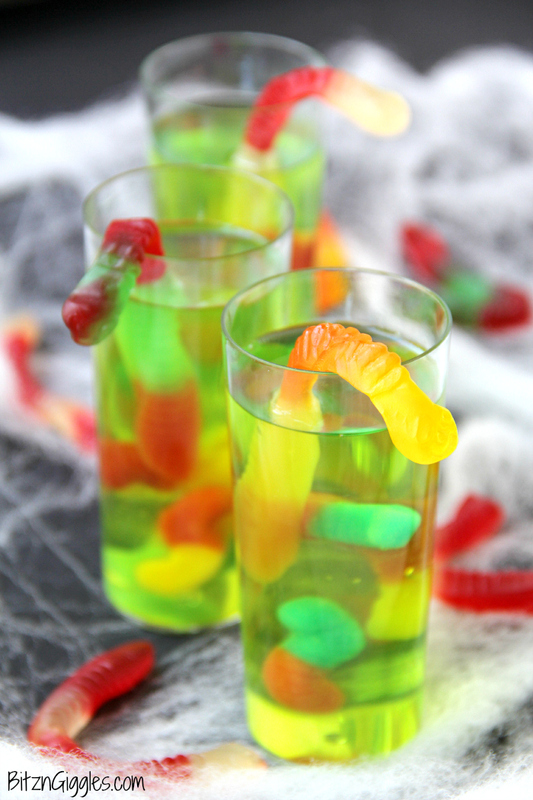 Halloween is just a little over a week away and we’ve been busy getting our costumes ready, planning our Trick-or-Treating route and creating some fun treats. . .like these Gummy Worm Jello Shooters. Now let’s get one thing straight right away, these are kids treats, so they’re non-alcoholic. Pause. Just waiting for those visitors looking for adult treats to close out my post and go back to Google search so they can find what they are really looking for. 😉 I know it’s going to happen. It’s okay. 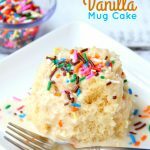 For those of you who are here for a cool kids dessert, you’ve come to the right place. All of you who loved this Gummy Worm Punch, or these Bloomin’ Dirt Cups, or this gummy worm experiment called, Electric Eels, I hope you’re back again for another fun gummy worm post!! 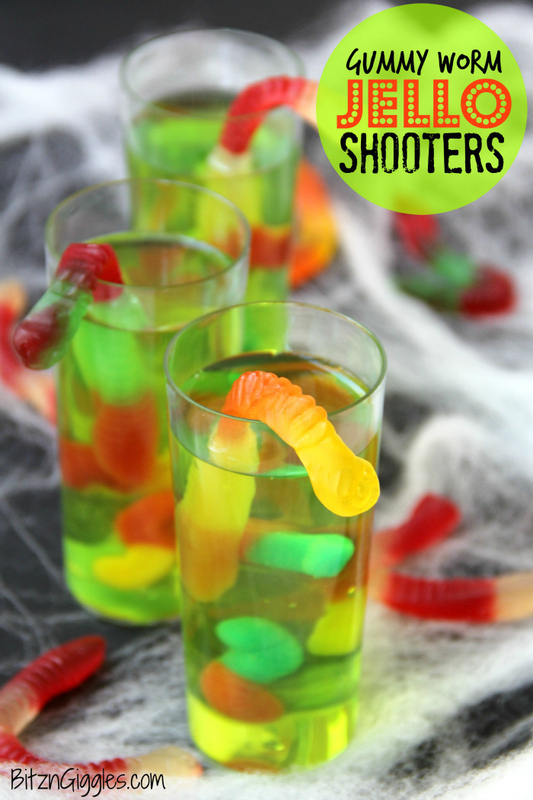 These shooters are crazy cool for mad scientist parties and Halloween! 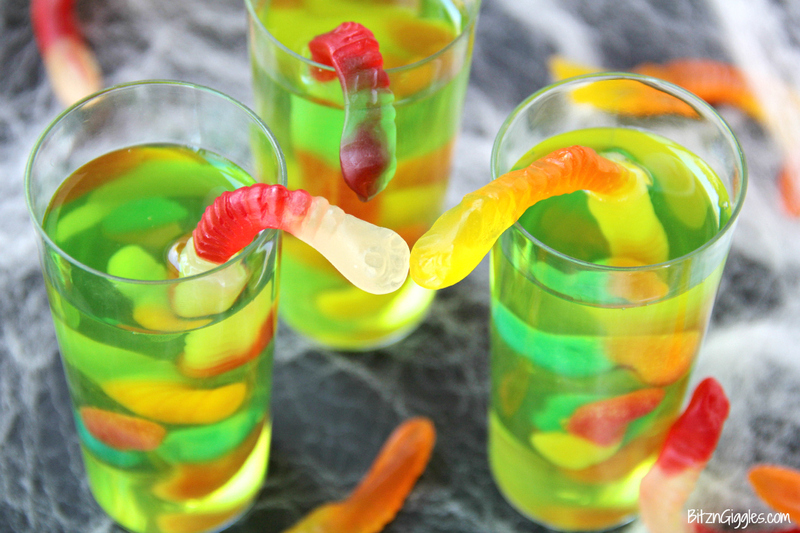 Gummy worms are suspended in green jello and if that weren’t enough, the treat is garnished with a full size worm “crawling” out of the glass! So, let me tell you a little bit about what I used to make the treats. I was able to find everything at Walmart except the shooter cups. Just for a visual I’ve included some links to the products on Amazon. So in a nutshell, worms, worms, more worms and some jello. Got it? The secret to making these shooters look creepy cool is what I like to call, “suspension.” What do I mean by suspension? Well, take a look. After you fill the shooters about halfway with gelatin (I set my cups on a cookie sheet to keep them balanced before I addd the gelatin, and then placed the sheet in the fridge), you place them in the fridge and allow them to soft set before adding the worms. At this point the gelatin is still soft enough to insert the worms yet firm enough to “suspend” them. Regardless of whether or not you wanted to suspend them, this step is a necessary one. If you would put the worms in the glass before adding the hot gelatin, the worms would melt, or disintegrate (as I like to call it). Your worms would be “composted” into the liquid gelatin. To keep your worms visible and present, follow my fridge instructions. 😉 I won’t steer you wrong, I promise. I chose to use the mini worms because I wanted to be able to add a few of them to the shooter and I thought they would probably be a bit easier to position within the cup. You also get a sweet/sour flavor combo by adding two kinds of worms. The second thing I learned is that when you put gummy worms in jello, they expand. Compared to the skinny worms I added at the beginning to the fat ones that appeared after the jello set was incredible. Maybe I should have titled this recipe, “Magic Grow Worm Jello Shooters.” You can kind of see the difference in the body of the worm hanging out of the shooter. The half that is in looks like it’s inflated. Isn’t that crazy? It’s an oddity and I love it. 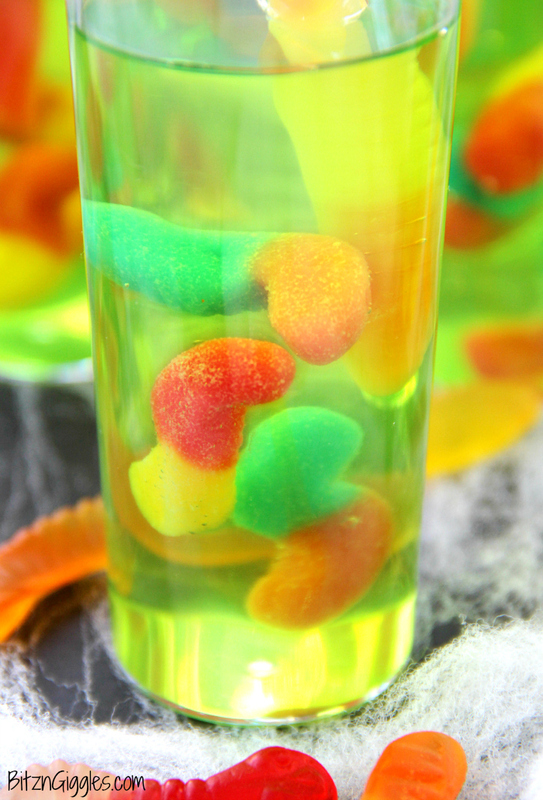 If your kids love jello and gummy worms, they’re going to go crazy over these shooters. The recipe makes 6 shooters. 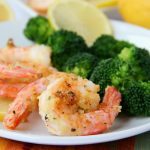 If you need to double or triple the recipe, just make sure you have room in your fridge for all of them to set! 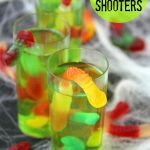 It’s time to get those last minute Halloween plans finalized, so make sure these shooters are on the menu for the big party! Enjoy! A fun kids treat perfect for mad scientist parties and Halloween! 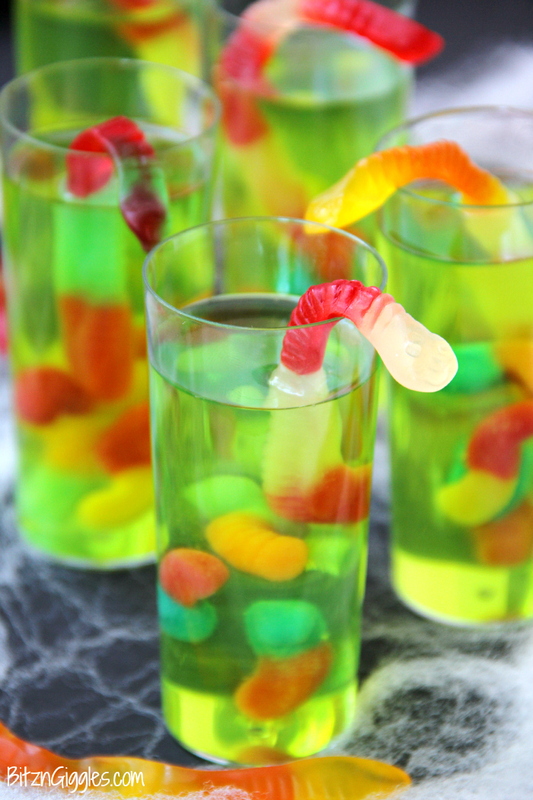 Gummy worms are suspended in green jello and the treat is garnished with a full size worm “crawling” out of the glass! Prepare gelatin as directed on box. Fill each plastic shooter halfway with the gelatin. Place the shooters in the fridge for 45-60 minutes, reserve the remaining gelatin. Remove the shooters from the fridge and use the wooden skewer to push 3-4 of the mini crawlers into the gelatin. 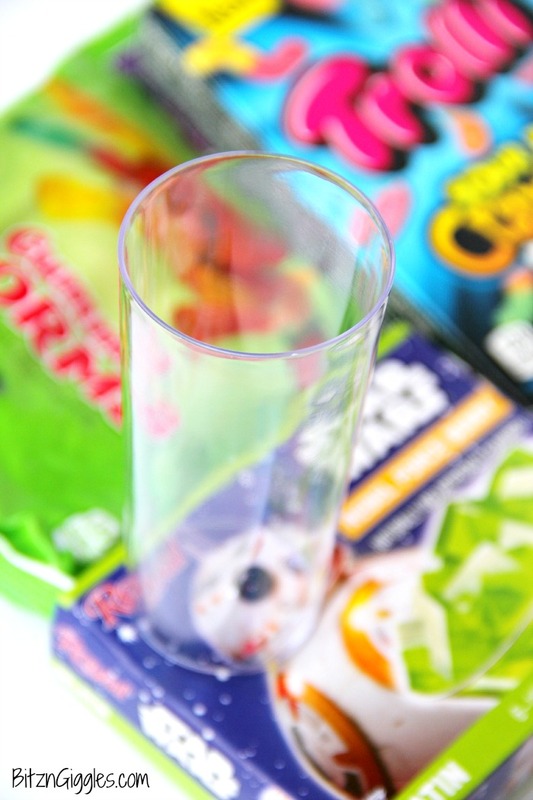 Hang a gummy worm over the rim of each of the shooters and fill the cups with the remaining gelatin, leaving about an inch of space on the top. Place back into the fridge for 3-4 more hours or until fully set. These little shooters are so fun!! I really want to have a grown up party, just to make them! My kids would go nuts at these. They look so festive and fun! These are cute. I am attending a Halloween party for the above 21 set…these might be made and slightly altered. These are so fun, Sara! I love how creative you always are! These are awesome! My kids would flip out over these! 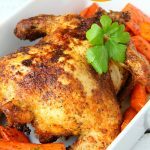 We are hosting a little Halloween get-together before going trick-or-treating with friends and I have been looking for some fun ideas. 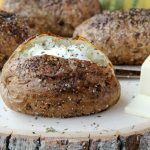 Might have to make these, Sara!